Player? plug-in to listen to the sample audio files. 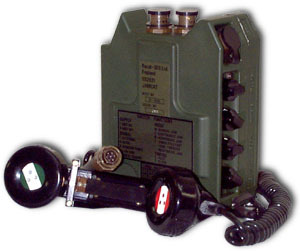 The JAMCAT is an Electronic Warfare attachment designed to be used with any combat net radio thus transforming any communications equipment into an EW jammer. The JAMCAT includes 4 modes of operation. In the manual mode, the push-to-talk switch on the handset is pressed to key the transmitter and produce jamming signals on operator demand. In the continuous mode, signals are produced without operator intervention. In the responsive mode, an internal signal activated switch is used to key the transmitter for a short period of time when an incoming signal is detected during the look-through period (look-through mode). In the simulated fast look-through mode, the JAMCAT simulated the effect of a fast look-through responsive jammer. White Noise, Random Tones, 1kHz Sinewave, 500Hz Squarewave and an External audio input/output. Power sources for the JAMCAT can be a Ni-Cad battery, a battery cassette using C cells or an external DC power supply adapter for vehicle use.